A quick snapshot of the jellyfish we saw during our visit to the Maritime Aquarium in Connecticut yesterday. Cool and creepy. Wow!! Now that is cool. I love how clear you can see through each one. Wow, those are so so pretty! Great photo. It reminds me of the time I was in China and thought I would do the Chinese thing of greeting the sunrise at the ocean. Hundreds of people were on the beach and most of them were collecting jelly fish - to serve up for their lunch. That is a great photo.... 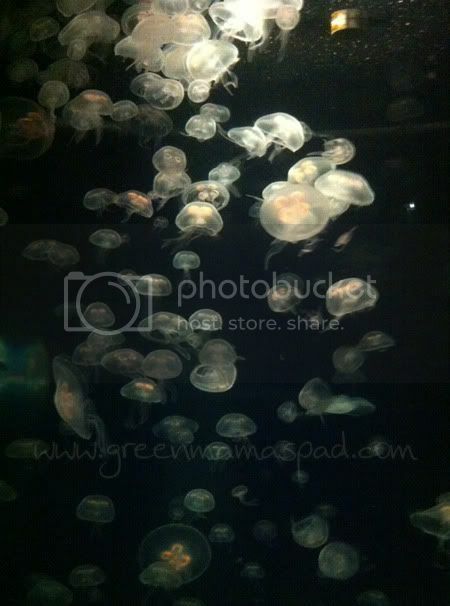 I love the way jellyfish look, they are so awesome. Do you know I lived in Connecticut for 35 years and NEVER went to the Maritime Aquarium. I really wish I did. Jellyfish are so unique - beautiful picture. Awesome photo! So many jellyfish! They are so majestic and creepy, I felt that way when I saw some last month in Kentucky! That is an awesome photo. I have never seen jelly fish like that before. That photo is wicked cool! That is really pretty... wouldn't want to be swiming in there though! They are really cool! There is a tank like that at the Toronto Zoo. That photo is AMAZING . . . I have never been able to get a good pic of Jellyfish at our aquarium. What a COOL picture! Great shot! I find those incredibly fascinating!